In December, leaders from 195 countries came together in Paris to adopt a historic agreement that limits global average temperature rise to “well-below” 2°C compared to pre-industrial temperatures. The agreement also commits countries to addressing the unavoidable impacts of climate change and enhancing the resilience of communities most at risk to climate impacts. Commentators and activists agree that while the Paris agreement is a breakthrough in global commitment to tackling climate change, the “hard work” starts now and we are on a long and bumpy road to achieving the emissions cuts needed to meet this goal. This is true, and the ambitious Paris goal will require comprehensive policy changes that encourage a global shift to renewable energy and significant financing for adaptation to climate impacts. We also know that a 2°C goal may not be enough to avoid catastrophic losses of life, property, and cultural heritage in some of the world’s most vulnerable locations. Dramatic images of coastal inundation in places as different as Florida and Bangladesh show that impacts of climate change are already happening and will affect the safety and well-being of vulnerable communities all over the world. This focus on the hard road ahead distracts from another important message in the post-Paris conversation. We have before us an unprecedented opportunity to work together on building a stronger, more inclusive, and resilient society. The challenge ahead is not insurmountable and we have plenty of examples here in Canada of the inspiring work that cities and communities are doing to manage the risks from climate change. Vancouver was the first city in Canada to adopt a comprehensive strategy on adaptation and is working to implement changes across the city, such as updating the city’s building code to account for increased frequency and severity of flooding, planting trees to make neighbourhoods more resilient to heat waves, and investing in backup power supplies in case of severe storms. In Halifax Harbour, one of Canada’s most important economic assets, the Halifax Regional Municipality has raised minimum ground elevations for buildings in response to anticipated sea level rise. Over the twentieth century, temperatures in much of the Canadian North have increased well in excess of 2°C. In spite of the profound impacts this warming is having on people and ecosystems, we are also seeing high levels of resilience. People, wildlife, and flora change and adapt to new environments. Across the North, individuals are refining how hunting and fishing is done, and communities are engaged in planning for changes to permafrost, water, and shipping. 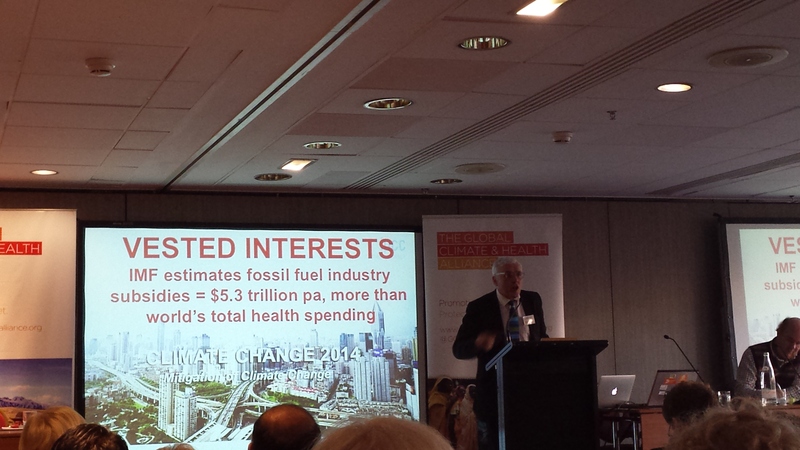 More is needed, but the will and interest in adaptation are there. Adaptation requires lengthy planning and funding for implementation, but has the potential to build stronger communities, improve health and well-being, and address social inequalities in addition to climate change. Adaptation parallels poverty reduction, health care improvements, and better education access and so makes sense under any climate change scenario. Climate change is one of the most serious challenges we face in this century but step-by-step we can work towards building a stronger and more resilient future. Addressing vulnerabilities to climate change promises that countries, provinces, and communities can simultaneously improve equality. We must pressure our national and local leaders to work collaboratively and achieve inclusive and robust changes in policy and financing for low-carbon, resilient communities. This is the promise that we can take away from Paris and start fulfilling today. Published by Malcolm Araos on January 8, 2016 at 4:55 pm under 2015 United Nations Conference on Climate Change. 0 comments. At a press conference held by the World Health Organisation (WHO) on Day 3 of COP21, a WHO representative declared that “everyone thinks this climate treaty is about the environment, about biodiversity, but really this is the most important public health agreement ever.” This statement was repeated at the Climate and Health Summit Saturday December 5th hosted jointly by the Global Climate and Health Alliance and the WHO. For the WHO, the UN body responsible for health, to make such a strong statement clearly shows the shift of the health sector to recognizing the gravity of the projected impacts of climate change on health. Climate change has been identified as the biggest threat to public health globally this century in academic literature, and yet recent work by the Tracking Adaptation to Climate Change Consortium (TRAC3) shows that many jurisdictions have yet to develop an adaptation plan or report any health adaptation initiatives. In Canada, for example, the province of Quebec emerges as a leader in public health adaptation, having implemented a large number of initiatives addressing a variety of the health risks posed by climate change. Meanwhile, other provinces such as Alberta have yet to develop an adaptation plan. Stepping up mitigation efforts now means that adaptation will be more likely to be successful in developing resilient futures. The difference between increasing temperatures by 1.5C and 2C will have vast impacts on the health of vulnerable populations. Not only that, but mitigating greenhouse gas emissions has substantial co-benefits for health, particularly for reducing chronic respiratory illnesses associated with air pollution. For example, currently the effects of air pollution on health and mortality are comparable to tobacco. Published by Stephanie Austin on December 10, 2015 at 8:54 pm under 2015 United Nations Conference on Climate Change. 0 comments. Reducing global greenhouse gas emissions is at the heart of the UNFCCC’s mission, but enhancing our ability to adapt to unavoidable impacts of climate change is gaining traction within the negotiations. In 2010 the Cancun Agreements stated that adaptation should be treated “with the same priority” as mitigation, and began the process of building a more robust global framework to support adaptation efforts across countries. The agreement identified key focus areas, including national adaptation planning, assessments, institutional capacities, enhancing cooperation across Parties, and strengthening data and learning about climate impacts and adaptation. In the draft text released today from the Paris negotiations we see promising signals that this commitment to enhancing work on adaptation continues to grow. Article 4, paragraph 1 of the draft agreement establishes a global goal of “enhancing adaptive capacity, strengthening resilience and reducing vulnerability to climate change” and introduces a new mechanism, adaptation communications, to track progress towards this vision. A key area of negotiation remains the adequacy of climate financing for adaptation needs, particularly in Least Developed Countries. With the UN’s own estimations indicating that current INDC commitments still bring us into the range of a 2.7-3.9C increase in global average temperatures, adaptation is more important than ever and a key area to watch as negotiations enter their final hours. Published by Alexandra Lesnikowski on December 10, 2015 at 6:02 pm under 2015 United Nations Conference on Climate Change. 0 comments. The Tracking Adaptation to Climate Change Consortium (TRAC3) presented their research findings on Saturday December 5 at an official COP21 side event titled “Tracking adaptation progress and enabling readiness.” Alex Lesnikowski, McGill doctoral student and project lead at TRAC3, joined a panel of four researchers seeking to develop global metrics to quantify climate change vulnerability and adaptation. During the course of the conference in Paris, over 150 countries are seeking to agree on global goals to reduce greenhouse gas emissions, but they will also need to decide how much and what type of support will be given to citizens worldwide who need to adapt to the impacts from climate change. While the estimated costs of adaptation worldwide will reach $140 billion by 2050, the global community still do not have clear ideas of what successful adaptation means and there are no systematic means of tracking adaptation policy planned in countries and cities globally. In response to these gaps, Ms. Lesnikowski presented her global Adaptation Initiative Index. The Index measures adaptation policy currently being undertaken in high-income countries. The Index facilitates an understanding of what adaptation policy looks like by classifying adaptation initiatives according to the vulnerabilities and sectors addressed, the stakeholders involved, the stage and approach to implementation, and whether vulnerable groups are explicitly supported. The study also captures progress through time in producing adaptation policy. High-income countries experienced a 87% increase in adaptation policy planning between 2010 and 2014. Despite the increase in the raw number adaptation initiatives, the study found fewer initiatives addressing vulnerable populations – 2.28% of total initiatives focused on vulnerable groups compared to 4.67% in 2010. This finding highlights a significant gap in adaptation policy and suggests that vulnerable groups such as women, indigenous populations, and the elderly are not necessarily prioritized in climate policy by their national governments. More information on the study can be fround in Lesnikowski et al.’s article in Nature Climate Change (http://www.nature.com/nclimate/journal/vaop/ncurrent/full/nclimate2863.html), as well as through the TRAC3 website (www.trac3.ca). 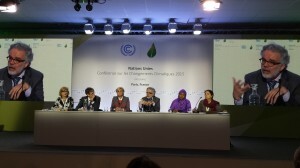 Published by Malcolm Araos on December 8, 2015 at 11:32 am under 2015 United Nations Conference on Climate Change. 0 comments. 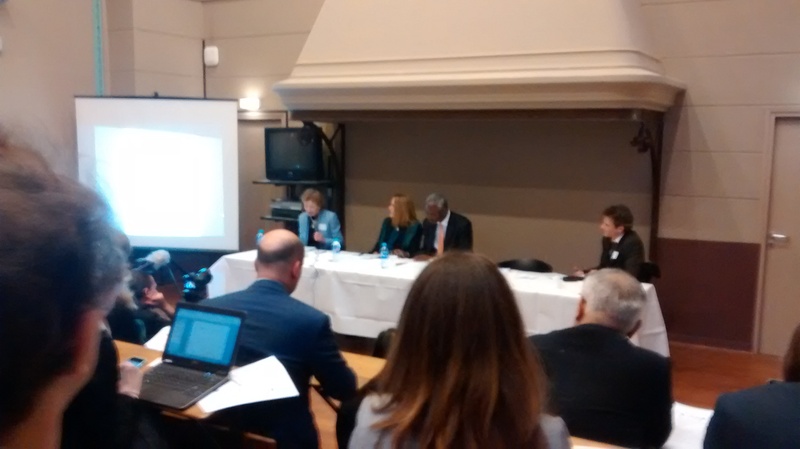 The Inaugural Climate Law and Governance Day was held on Friday, December 5th at the École de Droit de La Sorbonne in Paris, in the backdrop of the 21st Conference of the Parties of the United Nations Framework Convention on Climate Change (COP 21 UNFCCC). This marked the first of a new biennial event bringing together jurists, representatives from research and education institutions, associations and civil society organisations in their efforts to discuss and debate the role of law and governance in supporting the battle against climate change. The event began with a captivating speech by the Rt Hon Mary Robinson. Former Prime Minister of Ireland and President of the Mary Robinson Foundation – Climate Justice, Robinson is well know for her work in promoting human rights and notions of justice around the world. On Friday, Robinson addressed a full room while recounting the gains human rights have made in permeating the climate change debate over the last decade. While she served as the United Nations High Commissioner for Human Rights from 1997-2000, human rights and the environment (notably climate change) existed in silos. Today, the international community recognises that the two are inextricably linked, acknowledging that climate change is indeed a human rights issue. Robinson’s hope for the negotiations is that the Parties can produce an agreement guided by the values of the United Nations and those of human rights to create a framework that is both equitable and ambitious. Climate change is a question of justice, Robinson argued, given that that those most vulnerable to its impacts are least responsible for its occurrence – referring to the disproportionate effects climate change will have on less developed countries and the poor around the world, while the rich industrialised countries of the global north bear most of the responsibility. In her speech Robinson called on those present, and the broader governance community, to continue using law as a transformative tool to imbue the climate debate with the values of human rights, justice and equality – to assure no one is left behind. Going into the second week of the negotiations at COP 21, it is unclear whether and how the language of human rights will have a place in the operative text of the agreement. Although the draft text currently includes references to human rights, notably in Article 2, which figures in the purpose section of the agreement, some Parties, including Norway, Saudi Arabia and the United States have been criticised for seeking to have it removed. Nonetheless, whether reference to human rights figures in the final text or not, many, including Robinson, are optimistic that they will continue to influence and inform the global movement toward climate justice. 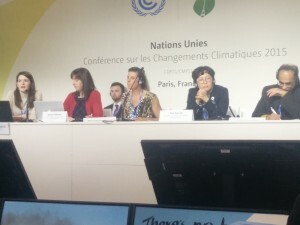 Published by Kathryn Hansen on December 7, 2015 at 6:58 pm under 2015 United Nations Conference on Climate Change. 0 comments. 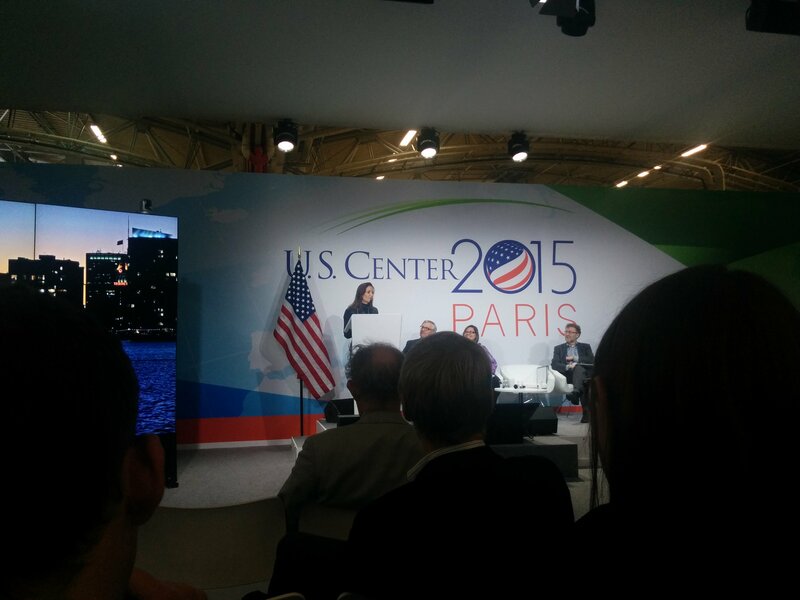 Cities are central to COP21’s mission of drastically reducing global greenhouse gas emissions. Two thirds of the world population will live in cities by 2050 and CO2 emissions from urban industry, transport, and housing are huge contributors to global climate change. On December 3, the U.S. Center at COP21 highlighted how the complex issue of climate change is tackled in three cities: Oakland, California, Kotzebue, Alaska, and Copenhagen, Denmark. Oakland mayor Libby Schaaf described her city’s innovative sustainability measures, including the modification of land use regulations to allow urban agriculture and requiring the re-use of 50% of construction debris. Copenhagen presented their ambitious plan to become completely carbon neutral by 2025, and showed impressive progress toward this goal by reducing CO2 emissions by 31% in 2014. While some cities strive to be more energy-efficient, others already face pressures to respond to climate change impacts. The city of Kotzebue in Alaska contributes very little to the warming of the atmosphere, but inhabitants are already experiencing food insecurity, coastal erosion, and changing sea ice. With regards to food security, Kotzebue has witnessed a sharp decline in local caribou and bearded seal populations, thereby reducing the amount of protein and iron available in the local diet and affecting the health of residents. For all three cities, the Paris negotiations are an opportunity to make their citizens aware that individual-level behaviours have a global impact. In the words Kotzebue city councillor Maija Katak Lukin, “we are suffering because you refuse to take a bike”. Published by Malcolm Araos on December 5, 2015 at 7:08 am under 2015 United Nations Conference on Climate Change. 0 comments. Towards a New Goal and Increased Finance? 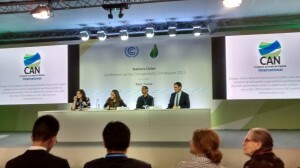 Climate Action Network International holds a briefing session on Dec 3rd, 2015 at COP21. Members from the Climate Action Network gave their impressions of the new negotiation draft agreement in a briefing this morning, just a few hours after its release. Although it is 4 pages shorter than the earlier version, opinions diverge on whether this indicates progress. One positive development, first noted by Kaisa Kosonen (Climate Policy Advisor for Greenpeace), is an increase in Parties’ recognition of the inadequacy of the 2°C temperature goal. According to Kosonen, advocates calling for a 1.5°C target appear to be gaining traction, and countries are increasingly recognizing that even a 1.5°C change is dangerous and hence the aim should be to reduce global temperature change as much as possible. Kosonen hopes this trend will continue once ministers take over the negotiation process. Alex Doukas from Oil Change International heavily criticized the reluctance of rich developed nations such as the US, UK and Canada for failing to pledge initially promised levels of carbon finance to developing countries for adaptation to climate change impacts. Doukas points to what he says is a hypocrisy on the part of these countries to claim a lack of financial resources while simultaneously providing large subsidies to fossil fuel producers. A new analysis just released by Oil Change International shows that these countries provide up to 100 times more financing towards fossil fuel subsidies than they are currently promising for climate finance. According to the analysis, Canada provides 79 times more money on subsidies to fossil fuel producers than on its climate finance pledge. Likely to garner some controversy, the comparison does not include domestic investment towards reducing emissions or transitioning from fossil fuels to renewable energy forms. Published by Kathryn Hansen on December 3, 2015 at 2:58 pm under 2015 United Nations Conference on Climate Change. 0 comments. Parc des Expositions, Paris Le Bourget. Site of the UNFCCC COP21. Members of the McGill University community, including both faculty members and students, have arrived in Paris to take part in the 21st Conference of the Parties to the United Nations Framework Convention on Climate Change (UNFCCC COP21). Follow the activities of the McGill delegates throughout their time in Paris on the McGill Climate Change Blog. Running from November 30th to December 11th, the conference is hoping to create a new international agreement on climate change, applicable to all Parties, in an attempt to meet the long term goal of keeping global average temperature increase to no more than 2°C – a target that is still within reach, according to the UNFCCC synthesis report on national contributions. This report, published on October 30th, studied the impact of intended nationally determined contributions (INDC’s) from 147 Parties on their greenhouse gas emission reduction policies. According to the report, the global trajectory seems to be moving away from the ‘worst case scenario’ of 4.5 to 6°C of warming by the end of the century, and although with current contributions from Parties, global temperatures are still projected to rise to approximately 3°C, the 2°C target can still be achieved, provided the process is sped up. Many agree providing for a review mechanism for the years to come is crucial to ensuring this increased momentum. Published by Kathryn Hansen on December 2, 2015 at 8:29 am under 2015 United Nations Conference on Climate Change. 0 comments.